Even with somewhat limited options, Cristiano Ronaldo cards and autographs are among the most pursued soccer cards in the world. One of the most recognizable global athletes, Cristiano Ronaldo has been an elite player for two huge franchises: Manchester United and Real Madrid. He also suits up for Portugal in international play and started his pro career at Sporting CP. Although quantities are not exactly plentiful, collectors can find examples that showcase each of these affiliations. Despite his immense popularity, there are not a ton of Cristiano Ronaldo cards available to collectors. However, starting with his time on the pitch for Sporting CP, various cards have been produced for the dynamic forward and that number is growing. 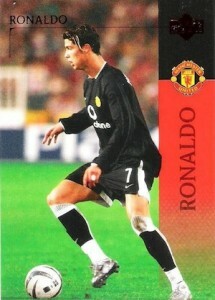 This card production was ramped up during the early period where Cristiano played for United, and several Upper Deck cards are available, including a few signed editions. Shop for Cristiano Ronaldo soccer cards on eBay. Since then, a variety of brands have released Cristiano Ronaldo cards, with noteworthy offerings from Topps Match Attax, Panini, Adrenalyn XL, Futera, Sportkings and Topps Premier Gold, among others. Although certified Cristiano Ronaldo autographs remain relatively scarce on the individual level, the overall number has increased significantly in the last few years and are his most valuable cardboard collectibles. 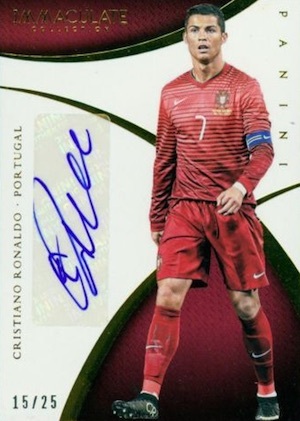 Collectors can look to 2014 Panini Prizm World Cup and 2018 Prizm World Cup for some of the key autographs from Cristiano, as well as other stars in the world of football. Also, the most high-end soccer set to date—2018 Eminence—includes on-card autographs for Ronaldo. The following list features many of the best CR7 cards for collectors to chase. Most are in short supply, but they are not impossible to track down. For a snapshot of the most popular Cristiano Ronaldo cards, take a look at the auction listings on eBay commanding the most excitement. 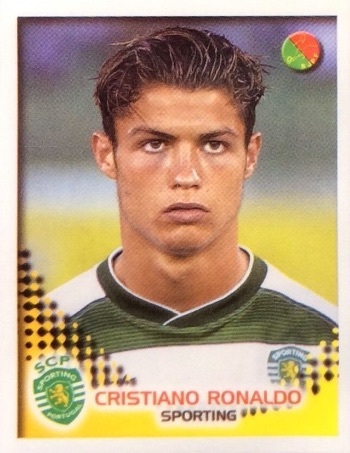 Cristiano Ronaldo's first card comes from his days at Sporting Clube de Portugal. 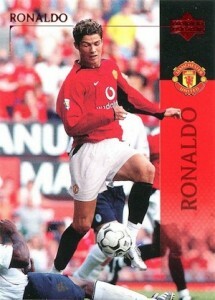 The card features an action image of a very young Cristiano and the value has been steadily increasing. 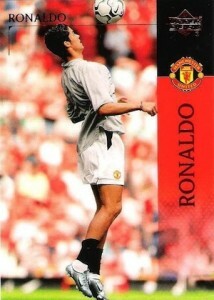 Most collectors consider this to be the true Cristiano Ronaldo rookie card and prices reflect that. Not quite on the same level as his traditional Mega Craques card, the simple sticker for Cristiano has still proven to be popular and valuable with collectors. Don't let the basic look fool you as high grades can push into the four-figure range. 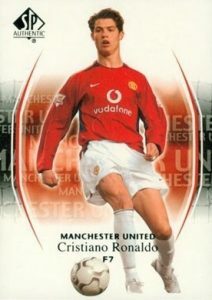 Cristiano Ronaldo came on the world stage when he joined Manchester United, and his first cards with ManU were produced by Upper Deck. Three different base cards document his inaugural season with the famed club and the limited parallels produce strong values. 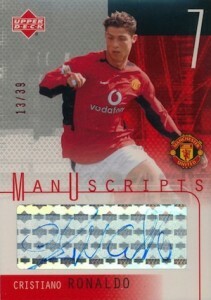 Also found in the Upper Deck Manchester United product, the very first certified autograph for Cristiano Ronaldo was a ManUscripts sticker autograph. The base red card is only numbered to 39 and a black parallel features a different image and is numbered to 25. The following year, SP Authentic produced a Manchester United product. One of the biggest highlights was a Cristiano Ronaldo Sign of the Times sticker autograph, numbered to 173. The horizontal layout offers a unique look, but most of the autographs from both sets have not held up well over time. He also has a trio of base cards in the product. 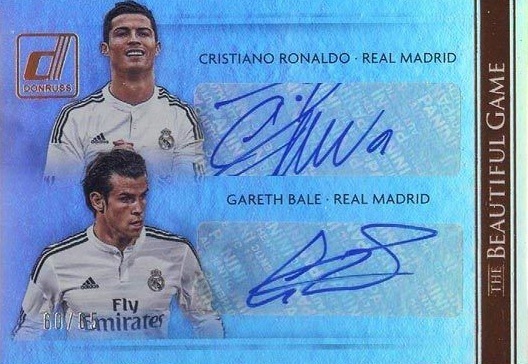 2013 Sportkings included five different Cristiano Ronaldo autographs, each numbered to just 15. The generic look is not ideal, but they are his first on-card autographs. There are gold parallels numbered to five, as well. Part of the 2013-14 Topps Premier Gold product that covered the EPL, Cristiano Ronaldo is the top autograph option despite leaving the Premier League in 2009. 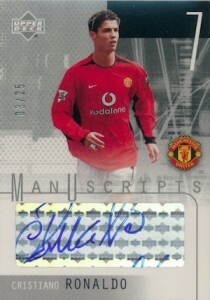 Although the base version that shows him with Manchester United is not numbered, base values are strong and numbered parallels command even more. 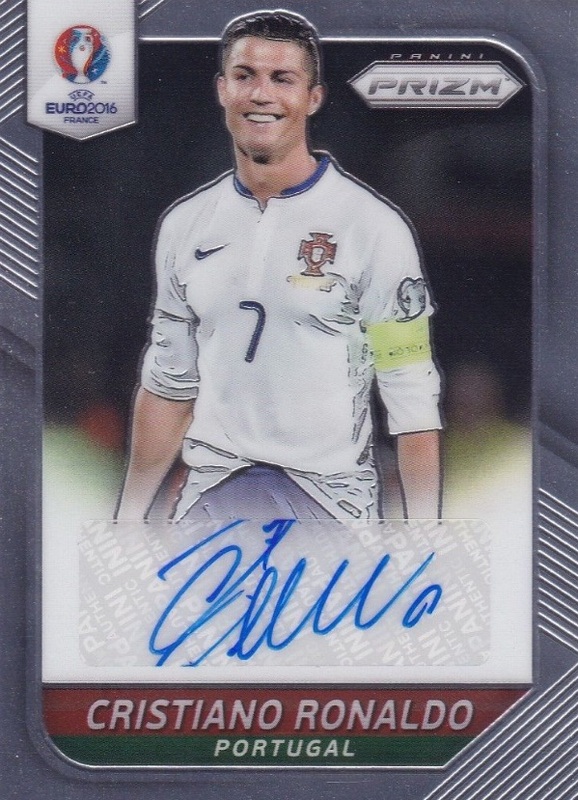 Documenting his 2014 World Cup with Portugal, 2014 Panini Prizm World Cup is still one of the most popular Cristiano Ronaldo autographs. Although no print runs were released, it appears that this card is less available than most of the other options from the set. 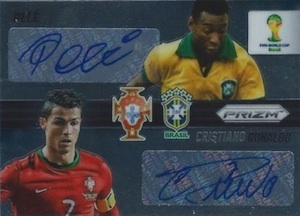 Collectors can also find a Combo Signatures insert that pairs Ronaldo with either Pele or Pepe. These rare cards carry a print run of ten base copies to go along with ten Prizm parallels, for a total of 20 of each. Part of a limited Sports Variations Autograph set in 2014-15 Immaculate Basketball, the unexpected Cristiano Ronaldo signature card gave CR7 collectors their first taste of the high-end hobby. 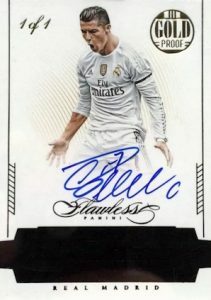 Featuring a club focus, 2015 Donruss offers collectors a Real Madrid autograph for Cristiano Ronaldo that takes things a step further by also featuring teammate Garth Bale. The combo signature card is limited to 65 copies. Leaf is another place to find autographs for Ronaldo, and one of the rarest pairs him with fellow legend Lionel Messi and rising star Neymar. Part of the 2015 Legends of Sport release, this is the only triple autograph in the set and they are tough to find. He also has single-player and multi-player autographs in other Leaf sets over the years. 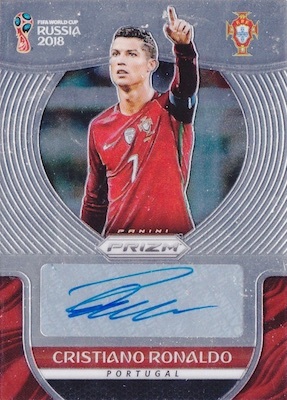 Ronaldo has several signed cards in 2015 Select but the general theme is Prizm technology and sticker autographs. The Jersey Autograph is particularly notable given the included relic piece. He also has autographs in the 2016-17 set and 2017-18 set, which even has hard-signed options. Taking on additional significance thanks to the 2015-16 Champions League title for Real Madrid that saw Ronaldo seal the win on penalties, collectors will actually have a very tough time tracking down this signed card from 2015-16 Topps UEFA Champions League Showcase. 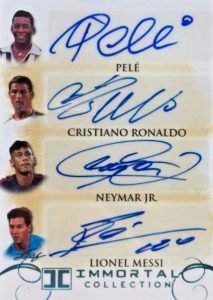 2016 Panini Flawless Soccer applies the luxury brand to Cristiano Ronaldo with several on-card autograph versions. More choices include premium relics and a base card with different gemstones. Fundamentally similar to his 2014 Prizm World Cup signatures, the 2016 edition tackles the UEFA Euro tournament with another Cristiano Ronaldo autograph and a mix of parallels. While he missed much of the final match due to injury, Ronaldo helped Portugal win Euro 2016 and earned the Silver Boot. With more hard-signed cards for Ronaldo collectors to chase, 2016-17 Noir Soccer brings limited print runs and contrasting designs of black and white or color. Although there are several versions, they are all quite rare. Yet another set packed with multiple Cristiano Ronaldo autograph designs, the high-end 2017 Immaculate Collection goes heavy on hard-signed editions, including the Premium Patches Autograph below. 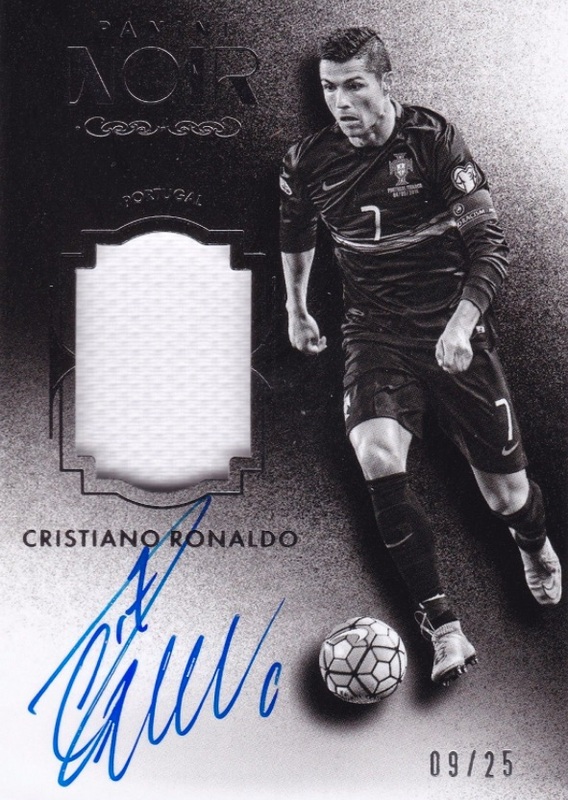 A top signer in 2018 Prizm World Cup, this Cristiano Ronaldo autograph is surprisingly not one of the announced short prints. 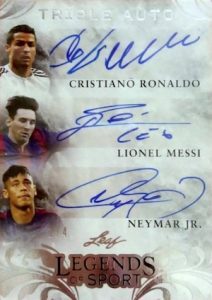 Nevertheless, it is a popular choice and there are also low-numbered parallels and multi-player autograph cards that include Cristiano in the lineup. 2014 Panini Prizm World Cup CRISTIANO RONALDO Yellow Red Pulsar BGS 9.5 AMAZING! 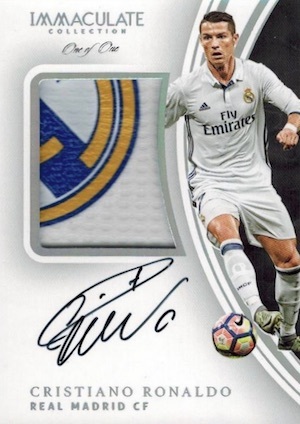 Just wanted to update you on the availability of ‘on card ‘ Cristiano Ronaldo autographed cards in that he signed a mere 10 cards of the Titans sub series for 2014 Futera World Football Unique , number #T81. I will gladly send you a copy from my own collection if requested.